Flowers EOPM is provided for you and if you want to make Flowers EOP more perfect, just do it with "EOP Music Master" and upload it now! "Flowers" (那些花儿) is sung by Pu Shu (simplified Chinese: 朴树; traditional Chinese: 樸樹) who is a Chinese singer who was born in Nanjing and grew up in Beijing. In 1994, he quit studying at Capital Normal University and started composing songs. 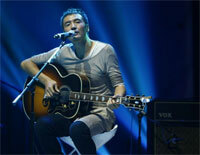 He became a signed singer in 麦田音乐 in 1996. His signature works are "Flowers" (那些花儿) and "Birch Forest" (白桦林). He alse has performed in films like "Flowers Blooming" and "If I Lose You".